The Regalo My Cot Portable Bed is a multi-functional cot for your little one who needs a safe, comfortable place to rest. An essential item for travel, sleepovers, nap time, picnics, and camping, the My Cot was designed for portability. Setting up in seconds wherever or whenever you need it, the 122cm long My Cot can hold children up to 75 pounds, and is ideal for children 2-5 years old. Made of steel construction, the versatile cot is built with durability, safety, and convenience in mind. Sturdy canvas material lines the cot while a fitted sheet is included for added comfort while your little one rests or plays. The Regalo My Cot Portable Beds PVC-free frame is made entirely of steel, to handle the everyday use of a little one. The bed liner is made from a sturdy canvas material with reinforced stitching for added security. As an extra comfort feature, the portable toddler bed includes a cotton fitted sheet that fits snuggly over the frame. Were parents too, so we know you dont want to waste time assembling products. To keep it simple, we designed the portable toddler bed to set up in seconds and fold down compactly with a single motion. Whether your child is staying over at grandmas, taking a nap at day care, or picnicking at the park, the My Cot is perfect for activities indoors or outdoors. The Regalo My Cot Portable Bed comes with a carry case to make traveling a breeze. Weighing just four pounds, the cot is designed to handle children up to 75 pounds and measures 122cm long by 61cm wide by 18cm tall, making it ideal for children 2-5 years old. 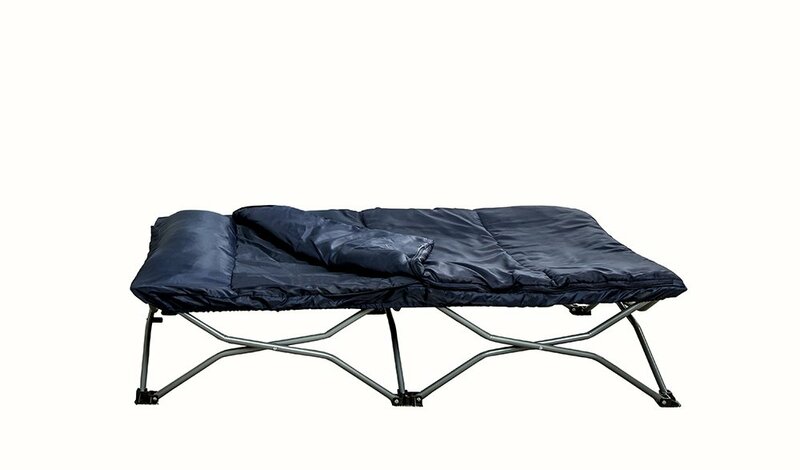 The go-anywhere cot folds to a fraction of its size, which is perfect for traveling. It can even fit in a standard sized suitcase, so everyone can have their own sleeping space when spending the night away from home. Because we know little ones tend to make a mess, the My Cot Portable Bed is made from heavy-duty, waterproof nylon. The liner cleans up quickly with a damp cloth and soap and the included cotton fitted sheet is machine washable for easy cleaning.